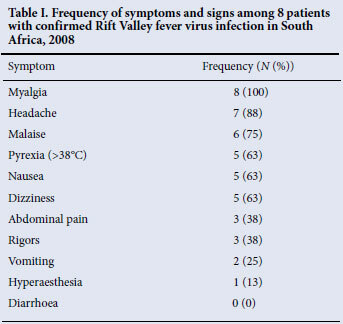 BACKGROUND: During 2008, Rift Valley fever (RVF) virus re-emerged in South Africa as focal outbreaks in several provinces. AIMS: To investigate an outbreak affecting cattle farmers and farm workers, and the staff and students of a veterinary school, assess the prevalence of infection during the outbreak, document the clinical presentation of cases, and identify potential risk factors. METHODS: We conducted a cross-sectional serological survey of exposed veterinarians and farmers, who were examined to determine the presence of current or recent illness. Blood specimens were collected for virus isolation, nucleic acid detection and serology. A subset was interviewed using a standardised questionnaire to obtain data on recent exposures and risk factors for infection. RESULTS: Of 53 participants potentially exposed to infected domestic ruminants, 15% had evidence of recent infection and 4% evidence of past exposure to the RVF virus. The prevalence of acute infection was 21% in veterinarians compared with 9% in farmers and farm workers. After a mean incubation period of 4.3 days, the most frequent symptoms experienced included myalgia (100%), headache (88%) and malaise (75%). No asymptomatic cases were identified. Transmission by direct contact with infected animals was the major risk factor in these professional groups. Performing animal autopsies was significantly associated with acute infection (risk ratio 16.3, 95% confidence interval 2.3 - 114.2). CONCLUSIONS: Increased risks associated with veterinary practices highlight a need for the use of personal protective equipment, and identify veterinarians as a primary target group for future vaccination. Rift Valley fever (RVF) is a viral zoonosis endemic to Africa1 that primarily affects domestic ruminants, causing large epizootics with high mortality rates in young animals and abortions.1-3 Transmission to humans occurs through direct contact with infected animal tissues, blood or other body fluids, and less commonly by mosquito bites. Inhalation of aerosolised infected fluids or ingestion of unpasteurised milk from infected animals might also be less frequent sources of infection.4-5 Since contact with sick animals and animal products, including blood, meat and milk, is the major risk factor for acquiring RVF, occupational groups such as farmers, slaughterhouse workers and veterinarians are at an increased risk of infection.4,6-8 No human-to-human transmission has been documented. Infection in humans is typically asymptomatic or limited to a mild febrile illness. Complications are rare, but may manifest as encephalitis (1 -10%), hepatitis (<1%), haemorrhagic fever (<1%) or retinitis (<1%).5 Deaths due to RVF virus (RVFV) infections are rare (case fatality rate 1%).5 Long-lasting immunity follows infection, making RVFV a good candidate for prevention by vaccine, which may be expected for wider use in the near future.9 In the past, high-risk occupational groups in South Africa could receive an unlicensed, inactivated whole-virus vaccine against RVF.10 However, vaccination of cattle and other ruminants is encouraged using licensed RVF vaccines for veterinary use. During 2008 a re-emergence of RVF in South Africa was observed, with several focal outbreaks affecting livestock and humans across five provinces (Eastern Cape, Gauteng, Limpopo, Mpumalanga and North West). RVFV infection was confirmed in animals by the Agriculture Research Council-Onderstepoort Veterinary Institute (ARC-OVI) and the University of Pretoria. We report the subsequent outbreak of RVF in dairy farmers and farm workers, and the staff and students of a veterinary school. We investigated the prevalence of RVFV infection among them, their clinical presentation, and the risk factors associated with infection. We conducted a cross-sectional serological survey of the exposed staff complement of farmers and farm workers from dairy farms with confirmed RVF in animals, and veterinary school staff and students exposed to carcasses and tissues of infected animals. Participants were examined to determine the presence of current or recent illness with symptoms compatible with RVFV infection. The suspect case definition included any person presenting with influenza-like illness (including fever >38ºC, myalgia or headache), or any illness with features of fever with encephalitis, haemorrhage, hepatitis or ocular pathology, with onset of illness after the date of exposure to the affected animals. A subset of the two occupational groups was interviewed using a standardised questionnaire for data on recent exposures and risk factors for infection. This included all participants meeting the confirmed case definition (acute infection), and a convenience sample of exposed individuals without documented illness (non-infected), excluding individuals with a laboratory-proven past immunising event, from the same occupational group. Data from completed questionnaires and laboratory results were captured and analysed using Epi Info 2000 (version 3.5.1, Centers for Disease Control and Prevention, Atlanta). Risk ratios (RRs) were calculated to compare infected and non-infected cases, and a chi-square test was performed with p-values <0.05 considered significant. Ethics clearance for essential communicable disease surveillance was granted to the NICD by the Human Medical Research Ethics Committee of the University of the Witwatersrand, Johannesburg (protocol number M060449, reference R14/49 Schoub). This includes outbreak investigations related to notifiable medical conditions under surveillance, including RVF. A total of 53 participants from the exposed groups were surveyed, including a complete staff complement of 22 dairy farm workers and 31 veterinary school staff and students. Of these, 30% (nfarm=7 and nschool=9) met the suspect case defection - presenting with illness compatible with RVFV infection. Of 53 blood specimens, 15% (nfarm=2 and nschool=6) were confirmed as having an acute RVFV infection. In 4% (nschool=2), anti-RVFV IgG was detected in the absence of anti-RVFV IgM; they were therefore classified as previously immunised, but we could not determine whether this was due to prior RVFV exposure or vaccination. Excluding the non-susceptible individuals, the attack rate of RVFV infection was 16% (8/51) in the total population surveyed, 9% (2/22) in the dairy farm group, and 21% (6/29) in the veterinary school group. Of the 8 laboratory-confirmed cases, 4 were aged 20 -29 years and 5 were male; 4 were diagnosed by detection of anti-RVFV IgM alone, 3 by PCR and virus isolation, and 1 by PCR alone. 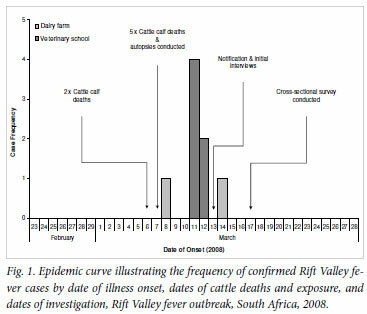 Onset of illness of the two farmers was 2 and 8 days respectively after contact with sick or dead calves; however, timing of exposure may have varied (Fig. 1). The date of conducting the animal autopsies, and therefore exposure, was known for the veterinary school group and a mean incubation period of 4.3 days (range 4 -5 days) could be calculated. All participants with laboratory evidence of recent viral infection were symptomatic and met the suspect case definition criteria. The most frequently reported symptoms included myalgia (8/8, 100%), headache (7/8, 88%) and malaise (6/8, 75%), and 63% (5/8) were pyrexial (Table I). Four (50%) of the confirmed cases required hospitalisation, and RVF-associated encephalitis developed in 1 patient (13%) approximately a week after the acute episode. The immunological response of the 4 hospitalised cases, measured during the acute episode (Table II), showed raised levels of C-reactive protein (CRP), aspartate transaminase (AST) and alanine transminase (ALT). Three of the 4 patients had raised neutrophil granulocytes and decreased lymphocyte counts. Total white blood cell and platelet counts were normal among all 4 patients. The 8 confirmed cases and an additional 22 susceptible, non-immune individuals from the two groups were interviewed. All confirmed cases had direct contact with either sick or dead cattle (Table III), and there was a statistically significant association between performing an animal autopsy and acute infection (RR 16.3, 95% confidence interval 2.3 -114.2). None of the other risk factors considered were significant. We documented an occupationally linked outbreak of RVF in farming and veterinary professionals coinciding with the re-emergence of RVF in South Africa after an extended inter-epizootic period. The 8 confirmed human cases in the two occupational groups surveyed suggest that exposure to either sick or dead cattle was the major route of transmission. We noted an elevated attack rate and a significantly increased risk of infection among veterinarians who performed autopsies. Inadequate use of personal protective equipment, and use of high-pressure water jets to clean equipment and surfaces during animal autopsies, may have contributed to an increased risk among veterinarians by direct contact with infected tissues, or exposure to infectious aerosolised body fluids. Our findings, and specifically the risk factor analysis, may be limited in power by the few study participants. Secondly, demographic characteristics were not available for the proportion of the surveyed population excluded from in-depth interviews (non-respondents), prohibiting comparisons with the respondent group to exclude differences that may introduce bias. Despite these limitations, this epizootic highlights the need for renewed vaccinations of ruminants against RVFV in South Africa. Increased risks of infection associated with veterinary practices emphasise the need for improved use of personal protective equipment and other preventive measures, especially while performing animal autopsies. This occupational group should also be considered as a primary target for future immunisation against RVF once human vaccines become available. Further strengthening of surveillance and intersectoral collaboration between the health and agriculture sectors will assist in rapid recognition and response to future outbreaks. The authors acknowledge members of the Outbreak Response Unit, the South African Field Epidemiology and Laboratory Training Programme (SA-FELTP), and the technical team of the Special Pathogens Unit, NICD-NHLS; public health registrars at the University of Witwatersrand; the Department of Veterinary Tropical Diseases, University of Pretoria, and ARC-OVI (for providing results of animal testing and participating in the outbreak investigation); Lancet Laboratories (for supplying haematological and biochemical data on hospitalised patients); and the South African Department of Health and the Department of Agriculture, Forestry, and Fisheries.